Traumatic Brain Injury (TBI) in the combat environment is a major cause of morbidity and mortality in recent armed conflicts. Our laboratory currently explores questions related to improving the clinical diagnosis of this disease process. 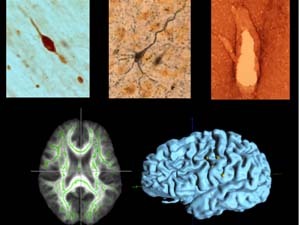 Ongoing work includes the design and application of novel molecular imaging probes for the detection of acute and chronic effects of TBI. We are also involved in exploring innovative ultrasound based approaches for the detection of TBI in a far forward environment, including a portable ultrasound unit designed to evaluate brain tissue stiffness (which is reduced after injury). In addition to investigating novel diagnostic approaches for TBI, we are also investigating the affect of repetitive low-level blast exposure as an occupational hazard for humans who routinely work in this type of environment. The goals of this work include determining whether military service members in this environment are at risk for development of mild TBI and helping to establish safe stand off limits for low-level blast exposure.